apparently JP ate the lunch as he signed the note. 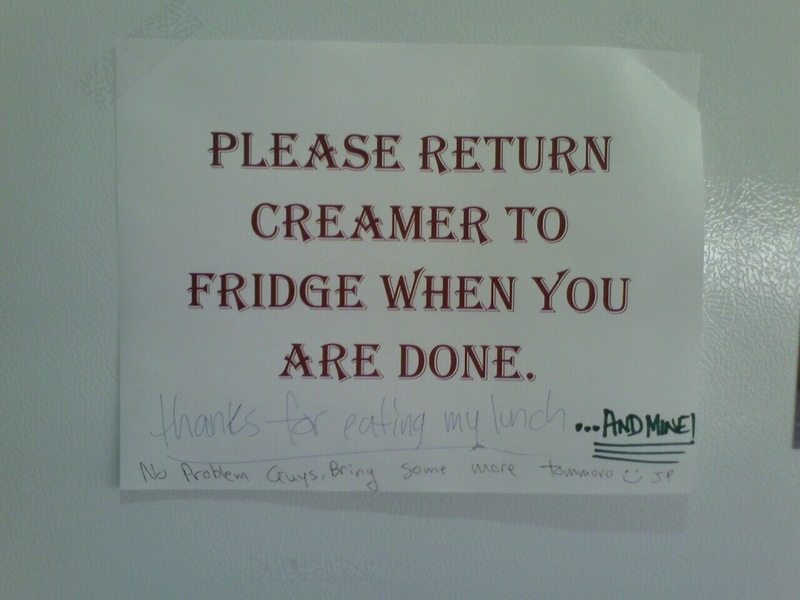 the irony here is that there is a cafeteria on the other side of the wall from the fridge . . .
i totally love point-counterpoint public notes. some people are just so ballsy! see, this is why i waste all my money on fast food every day….it’s a jungle in the fridge! later that day someone named ‘JP’ leaves another postit note, clarifying that it is NOT he who ate those lunches, but rather some other JP, or perhaps, even someone simply calling themselves JP, for the purpose of using him as the patsy. Great idea :-D….possibly even put something in there to tag the culprit; like food coloring. Tabasco sauce? Pfft. Bump that. You can even buy it as a chocolate bar. Maybe JP means “Just Playing” …That was the impression I got. I mean, is anyone called J.P. past middle school? smooth JP, you just signed the note and will probably be attacked by some passive aggressive coworkers! Steal my lunch once – shame on me. Steal my lunch twice – you’re eating what I sneeze.